Frank Glew was born in Clinton, Ontario, Canada. He is the fourth oldest of seven children. Frank grew up in a family with lots of love but little of money. During his childhood, he developed a keen love of nature, farming and sports. Hockey was his favourite sport. He played Pee Wee hockey up through to Junior hockey in his home area. He has taught in Tillsonburg, Toronto, Kitchener, Waterloo and Melbourne, Australia and University of Waterloo. Frank has taught at all grade levels of education from grade one to university. In his 35 years of teaching, he has held the role of teacher, vice principal, principal, consultant, coordinator and university professor. Frank was the creator of the popular game, "Instincts for Survival", (Animal Game, Survival Game) an environmental simulation game that is still played in most Outdoor Environmental Programs throughout the world. Students, play the role of wild animals in a forest food pyramid The game is played in a natural setting, Animals/students are identified by wearing coloured vests. It develops empathy for all wildlife and gives you a real feeling for the plight of wild animals. The game is remembered longer by students than any other environmental program. His main field of expertise is in the area of environmental science education. He believes in a holistic, integrated and active student centred approach to learning. He has practiced these beliefs in a pragmatic way throughout his career. 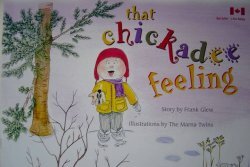 Frank has written 11 children’s picture books and is the recipient 14 Awards for his work in environmental education. The author has donated more than $700,000 worth of books to needy Ontario schools from Windsor to Ottawa. Frank has been a keynote speaker at many national and international conferences. He presents 40-50 workshops a year to students promoting literacy and environmental science education. His main thrust now is presenting his picture books to students in their own school library and spending as much time as possible with his grandchildren.